Here at Bournemouth Canoes we have many years experience of supplying canoes, kayaks and equipment to commerical and charitable organisations such as Activity Centres, Scout Groups, Schools & Canoe Clubs. As well as offering very favourable trade discounts we are also able to use our knowledge to offer advice on the best products for each of these organisations. After so many years of supplying to the outdoor industry we know exactly what works in a given environment and what doesnt! We are always happy to offer advice on centre paddling equipment so please feel free to give us a call on 01202 625256 and we can discuss your requirements . We always try to support our local paddlesport providers, centres and clubs through in store promotion, website links and advice offered to our customers - If you would like us to help promote your business then please get in touch either by phone or using the form below. 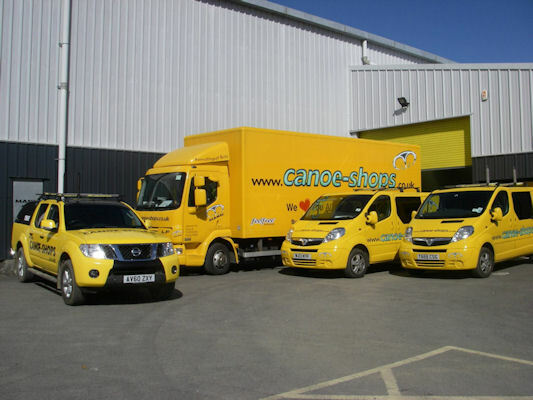 As part of the Canoe shops group, here at Bournemouth Canoes we are able to supply to centres and other organisations across the country with very reasonable delivery costs, thanks to our own network of vehicles. Cost's vary depending on order size and delivery address so please ask us for a price.